OK, maybe you do, but chances are, your infant does not. This is another item that is on a lot of “get this for your baby” lists and, for the life of me, I couldn’t figure out why. That didn’t stop me from trying to settle on one before Astrid was born though, just in case. Let me save you the trouble: skip it. I’m not saying you’ll never need one. You may, when (and if) your baby gets sick. That’s it. Croup or a bad cough or the like and your pediatrician will recommend slanting little Tyrone’s crib mattress up and turning on a humidifier to help him breathe and sleep better. Until then, you won’t need one (unless, as I say, you live somewhere parched and your doctor says so). 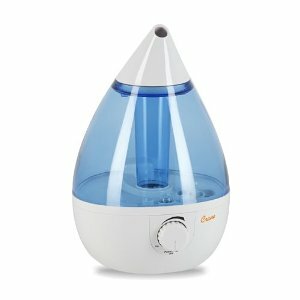 Don’t worry about preparing for that eventuality before it happens: humidifiers are relatively inexpensive ($20-60) and available everywhere (drugstores, Target, Amazon, etc.) Worst case scenario, you stop by a Walgreens on your way from the pediatrician’s when she told you to get one. See? You’re done. On the Crane, you can adjust the mist nozzle’s direction vs. having to turn the whole unit to redirect the mist, which is slightly convenient. It does have a visible light when it’s on, but it’s not irritatingly bright, and its, “I’m working!” hum is minimal. One note: if you have it on full blast, as we did during Astrid’s bout of croup, you will want to put some towels down in the path of the mist to protect your floor or carpet.